#Celesong is Friday, November 17th! Tickets to #Celesong, Wellspring’s fall benefit concert are selling fast! 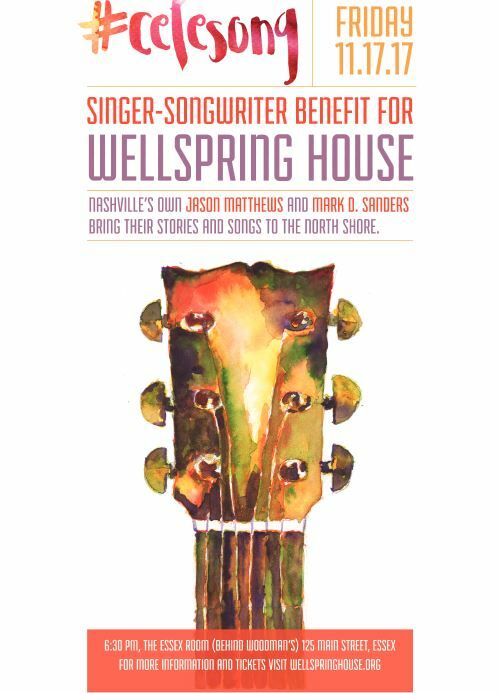 Singer-Songwriter Benefit for Wellspring House Featuring Mark D Sanders and Jason Matthews, bringing their stories and songs from Nashville to the Northshore. Join us for an evening of cocktails, family-style barbecue dinner and entertainment. We will offer a few special auction items as well as a Fund-a-Need paddle raise! All Proceeds support Wellspring’s homelessness prevention programs. Limited tickets and Sponsorships available. Special thanks to our sponsors Bank of America Charitable Foundation and Marketstreet Lynnfield!